Social media has obviously become a major part of every professional photographer’s marketing system, and everyone loves talking about Facebook and Pinterest, but we don’t hear too much about LinkedIn marketing for photographers, do we? LinkedIn has certainly had its ups and downs over the years, but it has proven itself to be the social network for serious-minded business professionals, which most photographers probably are. For that reason, I thought it would be interesting to look at some of the myths (and excuses) preventing some photographers from using LinkedIn in their marketing strategy. Why Is LinkedIn Not As Popular As Facebook? What stops some photographers from using LinkedIn to market their business, when they so openly embrace other social media channels, such as Facebook, Twitter, Instagram, and Pinterest? To find out, I decided to ask a few photographers for their thoughts on this. Nearly all of them said they use Facebook as a marketing platform, which is to be expected, so no surprise there. On the topic of LinkedIn, though, they said it plays only a minor role in their marketing. Some use it to stay in touch with other photographers, which is great too, but they don’t use it too much for direct marketing. The photographers who are making good marketing use of LinkedIn seem to be in the commercial fields, such as food photography, products, advertising, architecture, fashion etc. Portrait and wedding photographers, not so much. The truth is, LinkedIn may have started out life as a site designed to help professionals find work, but it very quickly evolved beyond that into something more powerful. A fast-growing network of serious-minded professionals who want to actively network in a meaningful sense with other like-minded individuals to facilitate the sharing of information about their profession or business. LinkedIn has also become a hub to facilitate real-world networking events, such as organizational meetings and other networking opportunities. Even if you consider it as a place where job-hunting is the main focal point, surely it doesn’t hurt if someone hires you for a photographic assignment as a result, right? Jobs come in many forms, not just as salaried positions in another company. Plus, all those connections you make on LinkedIn help to bring you another step closer to people who could well be great clients. As for LinkedIn not being suitable for marketing, nothing could be further from the truth. The system was actually built around the very concept of people marketing both themselves and others (through a system of recommendations and endorsements). There’s an important point to note here, though. In a big sense, marketing on LinkedIn is more concerned with the marketability of an individual or small business, rather than with the promotion of a specific product. Focusing on people’s marketability therefore makes it the perfect venue to market yourself as a photographer, since it’s YOU who is being marketed, not just your photography. This is where it’s vitally important for photographers to understand what differentiates them from other photographers in their area. For example, what is it about you that would give someone a compelling or overwhelming reason to hire you, rather than the photographer across the street? Identifying these differentiating factors is no simple task, and requires a great deal of reflection, introspection, honesty, and a willingness to listen carefully to how your clients feel about the experience of working with you. Usually, I’ve found these factors have little to do with the actual photography, and more to do with the personality, approach, philosophy and temperament of the photographer. This myth should have been busted a long time ago, but it still persists for some reason. Thinking about it, I find it ironic that a social network catering to “serious” professionals is not perceived as a serious network, simply because of its seriousness. I guess if there were more funny cat videos or silly status updates, then its “social-ness” might be taken more seriously by the masses. However, this point is really a good reason to join LinkedIn. The fact that the Facebook crowd behave differently when they’re on LinkedIn is a great advantage for marketing photography to a higher-end target market. Requests from connections usually tend to be more genuine, and often result in a higher percentage of booked clients. I’ve even noticed that emails from connections seem to be more business-like and polite (for the want of a better word) than from other social sources. This may or may not be true for your particular photography business, depending on whether or not your target market consists mostly of non-professionals with a lower-than-average disposable income, or who don’t value the art of photography in the way you would like them to. In other words if most of your photography clients are price-shoppers or bargain-hunters, or those who will only purchase a session because you include free digital files, then the chances are high that you won’t find them on LinkedIn. It’s a fact that the average income of LinkedIn users is significantly higher than the average Facebook user, and I used to joke that I joined LinkedIn because I wanted a raise. On the other hand, if your target client is a working professional, with a higher-than-average income, then LinkedIn might just be the best place to find them. Conversations that begin as a result of LinkedIn are also usually more serious and professional in tone, meaning there’s a better likelihood of making a productive business connection with the other person more quickly than, say, through a Facebook status update or a tweet. That’s not saying that Facebook or Twitter are ineffective at generating qualified leads, just that it can happen faster and more efficiently through LinkedIn. This one is really an excuse, especially if you’re ignoring LinkedIn when it could be a great channel for you. Yes, I know it’s hard work to maintain a presence on all the social networks out there, not to mention keeping your blog and website up to date, answering emails, talking to clients, taking photographs, processing images, conducting sales presentations, dealing with life in general etc. However, it depends on how much you want your business to thrive, doesn’t it? This is where marketing to the right set of people makes a big difference because you can make a conscious choice to attract fewer clients, but who have more disposable income. This gives you less sessions to deal with, but each with higher sales, giving you more time to tackle the other things in your business. So, LinkedIn could be a hassle if you still want to run a busy and chaotic photography business where your services are under-priced, your sales are all over the place, and you worry about breaking even, but I’m guessing that’s not too attractive to you. Alternatively, it may be worth the effort to invest some time in LinkedIn to attract the kind of clients that could slow down the frantic pace, yet provide you with a healthier bottom line. Think about what that might mean for your business and your life. Don’t you imagine it would give you more peace of mind and allow you to focus more on your creative purpose and vision? By the way, I would love to connect with you on LinkedIn, which you can do through my Personal Profile, as long as you’re in the photography business and don’t immediately start trying to sell me stuff. 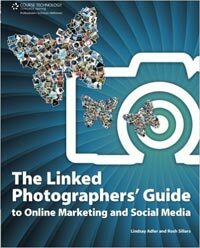 The Linked Photographers’ Guide to Online Marketing and Social Media is a complete resource for photographers looking to improve their business through social media. This book provides a step-by-step process for getting a photographer’s business online, and acts as a reference guide for the variety of online marketing options on the web. This one-of-a-kind guide is the key to making social media work for the photographer to improve their business!